The thing is, I think Toronto is a perfect city to visit. The pressure’s off for sightseeing – you know, that feeling that if you don’t see three major sights before lunch, you’ve somehow not ‘done’ a city properly – and it’s a perfect city to just chill and enjoy. Neat neighbourhoods. Great coffee. A relaxed urban vibe. And lots of trees, even in the heart of the city. It’s a neat neighbourhood that’s just the right side of hipster. You could spend a good long time just walking up and down, checking out the little boutiques, the bars with the open fronts, the bakeries with more versions of a doughnut than you can shake a stick at, a bookstore (Another Story – great name) that will have you happily browsing for hours. 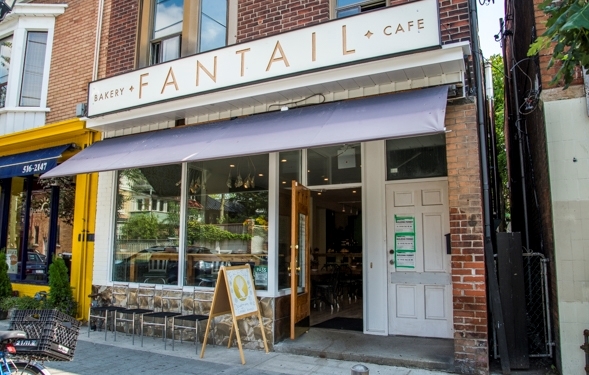 Check out Fantail for coffee – and lunch, if it’s that time of day. Great food, good coffee – and coffee matters to Canadians, like really matters – and a very stylish look and feel to the place. Heaving on weekends, but we had no trouble finding a table for five on a weekday. Lots of these Toronto neighbourhoods have gorgeous fruit markets – greengrocers to you and me – with local produce, and bits from further afield, piled high outside. You can quite literally smell them as you stroll by. And you’ll be properly tempted by peaches the size of baseballs. 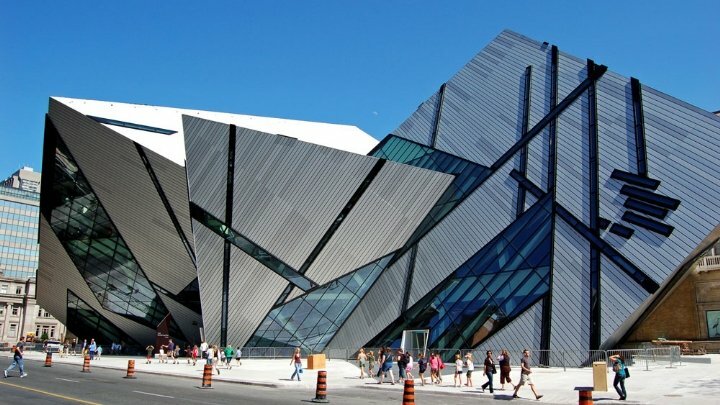 The ROM – calling it ‘The Royal Ontario Museum’ will scream ‘tourist’ long before you pull out your map and your camera – is slap bang in the heart of Toronto. 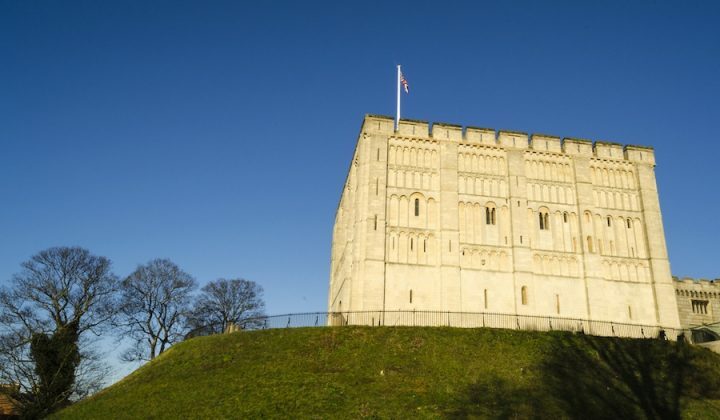 There’s an impressive older building – sort of Victorian era, I think – with a stunning modern addition that looks like a crystal has been dropped from space and landed on its edge, right in the middle of the city. The permanent collection has some amazing things to see: some natural history bits (including ‘the bat cave’ which I declined to visit) and lots of gorgeous art and history, with some stunning Chinese and Japanese exhibits. 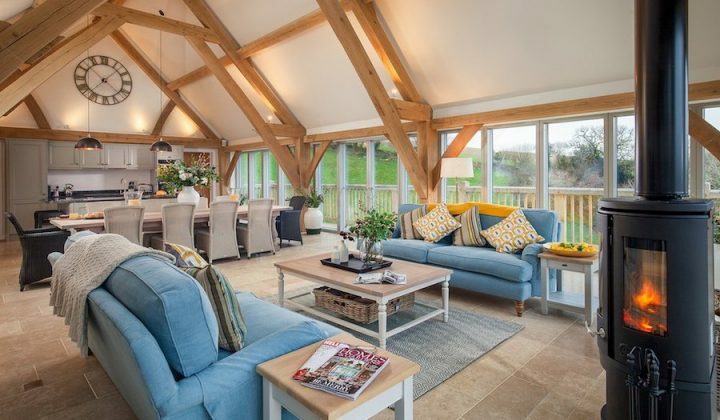 Definitely worth a look – either on a rainy day or get out of the heat and into the air con when it’s sweltering outside, as it can so often be. 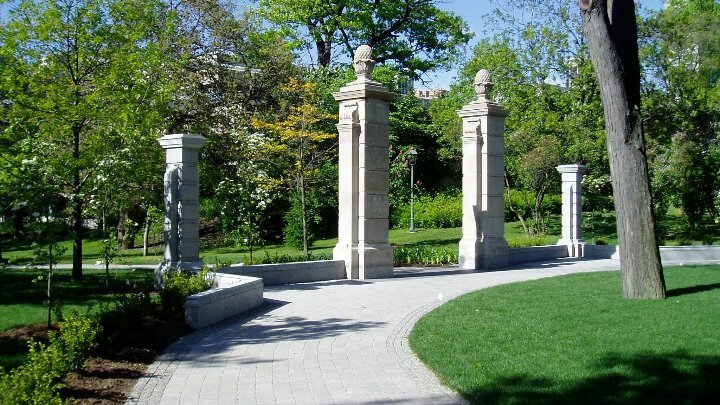 Philosphers Walk — a quiet little meander with your own thoughts, anyone? The area all round Bloor Street West is great for a wander afterwards. Some neat bars and restaurants, and you’re getting closer into big-city shopping down that way. Meander down Philosophers Walk – a gorgeous tree-lined walkway – too, or just take in the city life. There’s a very distinctive feel to Toronto city life, with the streetcars, the CN Tower peeking out between buildings, and the politeness. Jeez, I know it’s a bit of a stereotype of Canadians, but everyone is just so darned nice. A major city with smiling people – crazy! 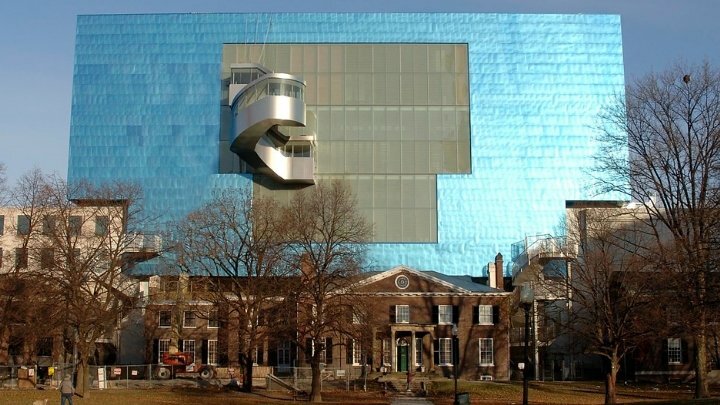 If you’re looking for more culture, there’s always the AGO (a-gee-oh) – or the Art Gallery of Ontario. Canadian art? Yes, there’s loads of it and it’s often stunning. Yes, those Americans are big and brash and noisy – and those Brits were, well, a bit overpowering sometimes empire-wise – but Canada has been sitting there quietly producing amazing artists (and writers, it has to be said) and you’ll likely be blown away by what’s there. Kensington Market – think vintage, mostly – is also coffee (again…) and street foodie heaven. Check out Jimmy’s for your coffee and just reveal in the choices for food. Or head to Chinatown and go in search of Mother’s Dumplings – where you’ll get, well, dumplings. And you’ll love ‘em. This whole area is a glorious mish-mash of hipster and hippy. Perfect people-watching territory. 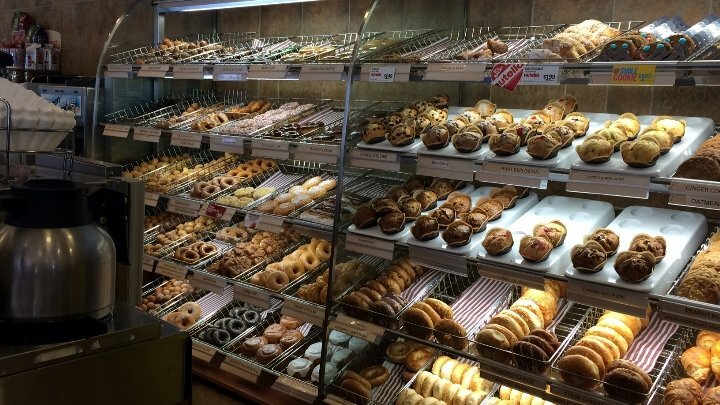 Ok, so Tim Hortons is a bit of a cliche when it comes to Canada — but seriously, check out those doughnuts! Of course, there are other parts of the city that are just as cool: Leslieville is, I’m assured, ‘really hot’ and there’s a restaurant there, Ruby Watchco, that is properly rated. The area north of Queen around Ossington Avenue, too – Trinity-Bellwoods – has a great park, a fabulous bookshop (Type) and a pastry shop (Nadege) which I’m told is virtually impossible to resist. High Park is a gorgeous green space heading down towards Lake Ontario and a sweet little neighbourhood in itself. And getting around is easy enough. There’s a shiny new train service – the UP Express — that gets you from Pearson airport to Union Station right downtown in about 20 minutes for less than £10. You get free wi-fi on board and lovely attendants in retro waistcoats. The downtown transit system is easy to navigate, and there are buses and streetcars as well as the trains (there’s something quite romantic about a streetcar). 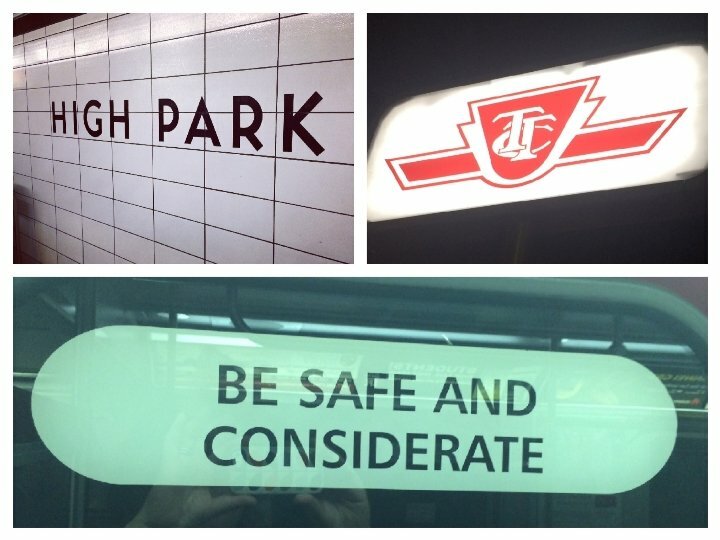 So add Toronto to your of must-see cities: a brilliant mix of people and a load of interesting things to see and do. You won’t be disappointed.